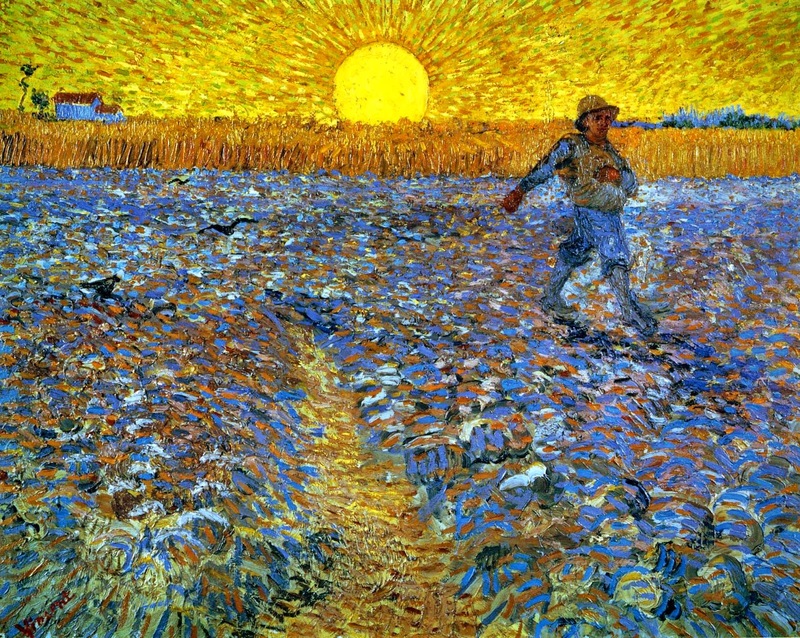 "The Sower (Sower with Setting Sun)"
In Arles, Van Gogh painted a series of canvases depicting a sower in the fields against the backdrop of a setting sun. His major source of inspiration for these was Jean-Francois Millet's The sower. Van Gogh regarded the seasonal growth cycle of the crops - particularly that of wheat- as a metaphor for the creation of new life, growth, flowering and finally decline. As such the activity of sowing as evening falls constitutes an apposite symbol for the continuity of life. Van Gogh wanted to give his sower a contemporary expression through a striking use of colour, working with what he called complementary contrasts such as yellow and purple. Through Van Gogh's efforts to create an emphatic palette, the effect of the twilight was initially lost: the bright yellow sun radiating bright brushstrokes of colour appeared a harbinger of the dawn rather than the night. In a later version Van Gogh toned down the yellow of the sky with green and gave the sun a dark outline, so successfully capturing the onset of nightfall.